Your detailed and full explanation was enlightening. Thank you. However, ignoring weight, I wondered if the friction cost could be overcome by exploring magnetic bearings and using and testing these. I appreciate weight is always a limiting factor, but if the engine is, throughout a mission, to be used over again, then surely reliability of such a system could be considered useful. I would appreciate your thoughs. Did you do some kind of unit test to determine that the seal was the culprit? Did you have to chase down a lot of red herrings during the debug process? One other question..why was the engine run at 99% power for A2J006? (according to the video description). Excellent overview! Thanks for posting this information. @Aaron: In order to help pinpoint the issue, the engineers followed a fault-tree approach. However, a big clue that it was most likely the seal came in the form of the post-test torque checks. It was taking more and more torque to move the turbopump rotor at ambient conditions suggesting that it was being rubbed or grabbed at those conditions. Also, the pump performance was higher than predicted and this too suggested a tighter than intended seal. So, there were lots of clues leading to the conclusion made and the action taken, but it was not until test A2J006 was conducted did we know for sure. Sometimes rocket science involves a little bit of spicy techno-drama. The reason that the power level was 99% was because we intentionally aimed a little low. If you remember, we’ve had a couple of early cuts due to having too much power (in part due to the high performance of the oxidizer pump). So we orificed the engine on the slightly low side to help ensure a full-duration test. Note, though, that anything between 97% and 103% is effectively full power level. An open-loop engine like J-2X doesn’t dial itself in like, say, SSME (see earlier article about engine control systems). @Antony: I didn’t talk about higher technology bearings because I didn’t want to make the article too complex. Talking about rolling elements as bearings is generally easier to picture for most people because they’ve seen them before. Anyone who has ever fiddled with skateboards or roller skates can picture ball bearings right away. However, you are correct. There are other technologies that can be used for bearings. The question that is usually asked is whether the greater complexity of these approaches warrants any potential advantages. 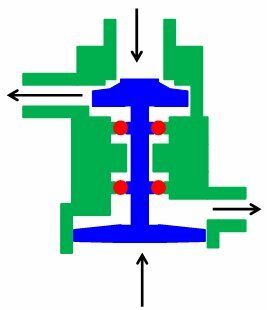 I have not personally seen magnetic bearings used in cryogenic pumps, but I am not a turbopump expert. Maybe they’re out there. But one bearing technology that has been used successfully on cryogenic turbomachinery is the use of hydrostatic bearings. 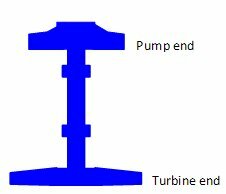 Here, the rotor is effectively suspended on a cushion of high pressure fluid, the same fluid that being pumped. 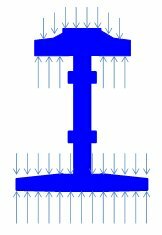 If you can get the rotor up and started and properly control the pressure distribution, this is an effective bearing approach. Regardless, though, of whether you have rolling elements or non-contact bearing technology, you still have to deal with thrust balance. The bearings hold the rotor in place laterally, but the thrust balance ensures that the rotor stays in the proper place axially. This was an excellent article. I really enjoy reading technical details about the inner workings of a rocket engine. It seems to me by reading this and several of the other posts that these turbopumps are really a big key in the whole engine. The fact that we have the best experts and you use vague descriptions in describing their inner workings (and in some of your previous posts you won’t show pictures of their insides) seems to indicate to me that this is what separates us from the rest of the world in terms of being able to build such powerful rocket engines. It also is fascinating to see that even some of the smallest parts have such a big impact on the overall workings of the engine. Not sure if you have an answer for this, but is it expected that the J2-X will have to work several times during a mission? or does it just fire once? if so, you mentioned in this post that, “In less-than-worst circumstances, operating with a thrust balance significantly different than the design intent could lead to unexpected wear on components and therefore limited operational life.” If it’s expected to only fire off once, can you indeed have less critical tolerances? Thank you for helping us understand this beautiful engine. I’ll bet it makes you appreciate those old engine design pioneers back in the 40’s and 50’s who had to design those first liquid fueled rocket engines without modern computers, and then build them without numerically controlled machine tools. I was visiting a Russian web site showing a cutaway of the guts of the NK-33 engine. Looking at all those seals, bearings and turbines I am still amazed that anything that complex can be built, much less be made to work without blowing itself to bits. We heard your 40 second test, 9.1 miles away inside a brick home with the TV playing in Slidell. At first, we thought it was thunder, until it went on and on. That new Infinity Museum should be fun during testing of the new rocket, should it be tested before shipment to Florida. It is 3.7 miles from the test stand. Those glass walls will shake a little, especially during the winter when the wind is blowing from the North. @Bruce: The reason that I sometimes use vague language to describe design details has two parts. First, because of the International Traffic in Arms Regulations (ITAR) law, it is illegal to not properly control technical data that could be used to inform weapons design. All of the pictures and diagrams and descriptions that get posted here must go through the filter of an export control expert (for whom I am greatly appreciative). Second, there are numerous cases where, beyond simple ITAR considerations, our contractor Pratt & Whitney Rocketdyne is using proprietary designs and/or manufacturing methods at the detailed level. One of the things that we agree to when we sign a contract with a company is that we agree to protect their trade secrets and intellectual property. Thus, everything that I post here also goes through a filter of checking for where I might have inadvertently included proprietary data. So, sorry if I am sometimes vague with regards to technical details, but in the interest of being a responsible citizen and a responsible customer, that’s what we have to do. And, yes, turbomachinery is a key element of high-power liquid rocket engines. Absolutely. Regarding the J-2X mission, it is designed to be capable of two starts during a given mission. However, remember that in addition to the engine starts during the mission, it has to be calibrated and green run on the test stand. 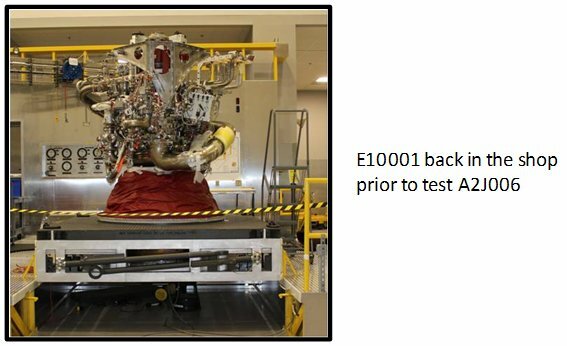 So, a new engine out of the box could have several test stand tests by itself, then there might be a stage-level test, and then, after that, comes the mission. If during any one of those tests you get an early cut due to, say, a minor facility issue, then you’ve eaten up some life without accomplishing your objectives. Thus, even for expendable engines, we built them with more operational life than just the scope of the mission.